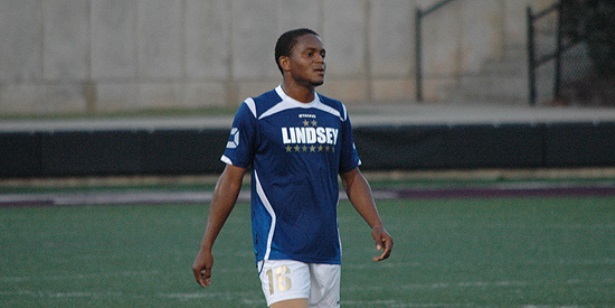 COLUMBIA, Ky. — Elijah Ukpong scored four goals and Xavier Baumgart scored twice as the No. 1-ranked Lindsey Wilson College men’s soccer team defeated St. Catharine (Ky.) 10-0 at Walter S. Reuling Stadium. The 10 goals are a season high for the Blue Raiders who improve to 7-1-2 overall and 3-0-1 in the Mid-South Conference. St. Catharine falls to 2-8 overall and 0-4 in conference play. Ukpong opened the scoring for Lindsey Wilson in the 8th minute off an assist from Aleksi Pahkasalo for the 1-0 lead. He netted an unassisted goal in the 13th minute to push the lead to 2-0. Ukpong scored again for the hat trick in the 23rd minute on another unassisted goal to make it 3-0. His night was not done as he scored another unassisted goal in the 57th minute for his fourth on the night. Baumgart netted his first goal of the night in the 28th minute with an assist from Ukpong. In the 41st minute, Baumgart added his second goal of the night on an assist from Yazeed Davids. Pahkasalo scored in the 43rd minute off an assist from Bastien Montagnon to push the lead to 6-0.